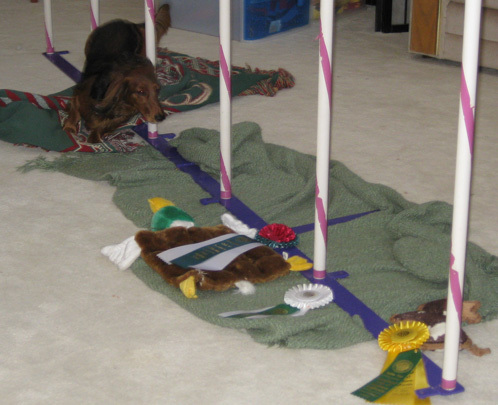 On February 6, 2011, Olive earned her Agility Excellent (AX) title and started her progress towards her MACH title. With her Agility Excellent Jumpers (AXJ) title on April 29, she can now earn double-Qs as well. She earned MACH on August 11, 2012 at the DASH trial in Fountain Valley, California. On February 22, 2011, Olive moved to the Preferred heights and started work towards her PACH title. Her progress is being tracked on another page. This is a record of all of Olive's runs in Excellent B (called Masters starting in 2013). Olive has 158 championship points and 12 double Qs towards MACH2. indoors on mats 46.46 (SCT 45). Olive checked up before each jump, and didn't make time. I shouldn't have used the warmup jump - the matting was a mess and it destroyed her confidence in the footing. Lori Sage 67.07 (SCT 67). Weaves were early, which should have meant a fast run, but Olive was still acting like she didn't trust the footing. She even walked the weaves. Just barely made time. indoors on mats 40.27 (SCT 44). Olive's first run on these soft mats started slow but she quickly got comfortable with the surface. Lori Sage 59.54 (SCT 69). I tried a cute way to handle a dog walk to tunnel turn and it was fast on entry but way wide on exit. Otherwise a fast, tight run. Lori Sage It sure would be nice to be able to run on mats every weekend! Olive looked strong even at 8". 61.72 (SCT 70). Olive ran with her nose down most of the time but ran a decent line and kept the bars up. dirt This course pretty much had every feature to demotivate Olive, so we went home instead. Alan Arthur 65.53 (SCT 71). Olive got a slow start on a four jump sequence (similar to the 31st) but picked it up towards the end. dirt NT (SCT 46). The surface was a mess with a lot of little pebbly clumps of dirt. Olive started limping after the double (jump 2) so I picked her up after the weaves (at 4). Tom Slattery 68.44 (SCT 76). Not the best course for Olive but she ran OK on a sloppy surface (I saw her slip several times). dirt 47.62 (SCT 50). A better start for our last run of the year, my timing was a little off heading into a tunnel and almost cost us an R but Olive drove on. Jan Skurzynski 67.09 (SCT 76). Not a good course for us - starting and ending with a line of offset jumps - but Olive had a good run, particularly after the weaves. In fact, so fast that she almost took a wrong course tunnel on me. Janet Budzynski After a couple of days doing Field Trials, it was good to turn in some nice runs. My handling was a little sloppy but Olive was driven. dirt 48.11 (SCT 47). We didn't get a great start, but while we were slow I didn't think we'd miss time. However Olive missed a pole in the middle of the weaves, so it didn't matter. Craig Josling 58.80 (SCT 71). A nice fast run on a fun course. Solid all the way through. Olive was awesome in warmup, and of course it was really cold. A good combination for us. dirt 46.85 (SCT 47). We're losing some time to the footing and to a wide line, but Olive still looked good on her fourth run of the weekend. Rhonda Crane 65.26 (SCT 73). A tricky course but Olive was solid. Not our best standard cun, but as you can see from the placement, good work. Lavonda Herring Another solid performance. It wasn't as cold as it was yesterday. The footing was much looser than yesterday. dirt 47.32 (SCT 50). Olive didn't look like she trusted the surface but she ran sufficiently fast to pick up a few points. Lavonda Herring 62.58 (SCT 76). It was cold out and Olive was running like she was on fire. Great contacts. Altogether nice run. Rhonda Crane It was really chilly for the first run, which is Olive's favorite condition. Jacqui O'Neill The ground was soaked in the rings and the parking lot. Olive kept up the good effort. Kera Holm A cooler day, small breakfast with victory boxes after each run. Olive looked like she was having fun, both in and out of the ring. grass NT (SCT 49). With the problems making time on the standard course, we didn't stick around for jumpers. Sharon Kihara 74.19 (SCT 71). Not all that fast, but the big problem was that I didn't call "big" on the double and it fell. wet grass NT (SCT 45). Olive wasn't enjoying the footing on the second course of the day so I was working hard to keep her moving. I ended up taking her on a wrong course so we did the weaves and headed out. Deb Carlson 70.23 (SCT 74). Not super fast, but a good run until a loose dog ran past the ring next to the dog walk. Olive froze on the up board and lost a good handful of seconds. grass 42.29 (SCT 52). Most of the opening sequence was up-hill, but Olive powered through and looked great later on in some good twisty bits. Christie Bowers 65.99 (SCT 76). I don't think Olive rested as well as she did between runs yesterday, but she still handled great and finished strong. Christie Bowers Olive really enjoys cooler weather. grass 43.60 (SCT 52). Olive broke her stay on the leadout and so didn't explode into the starting sequence like I wanted. But still a nice run. Christie Bowers 56.08 (SCT 74). A cold morning for our first run in a long while. A little slow on the dog walk, but otherwise a good solid run. Christie Bowers Our first run in a long time, and Olive looked great. grass 54.73 (SCT 46). Olive was reasonably fast on the second half, but the slow pace of the first half was enough to put us well over time. Michelle Fletcher 72.37 (SCT 76). A competitor after us set a bowl of cheese down as we were heading in the ring. Olive thought about going for it at the start, after jump 7, and maybe a few other times. Otherwise a nice run. grass 52.46 (SCT 49). The weather was much cooler today but Olive wasn't super fast on her second run, even with early weaves. A few seconds over time on an otherwise very nice run. All the 8" dogs were running tight on time. Rhonda Crane 72.06 (SCT 75). Fast and closing in on a nice set of MACH points, I supported the down contact on the dog walk, afraid she'd leave early for the ending tunnel. Instead, she ran out the tunnel entrance! grass and HOT 49.70 (SCT 49). It was really hot, and we knew that Olive wouldn't Q at her standard course pace, so I decided to run the outside of the opening sequence. Olive liked it and managed to make time, even at 90+ degrees. Michelle Fletcher 71.91 (SCT 76). It was hot for our first agility run, after doing Open Obedience in the morning. Olive looked good, although not super fast. Michelle Fletcher Really impressive that Olive worked hard enough for a double Q today! grass and HOT ? (SCT 50). Olive had her nose down most of the course - she just seemed tired and even though soaked was still hot. Time. Marq Cheek N/T (SCT ?). A decent looking start but Olive pulled out of a tunnel and then pretty much blew off the weaves. We left the course after that. grass and HOT 53.97 (SCT 45). Olive looked hot going in to the ring and never picked up much speed. Missed a weave pole and over time. It was really hot but Olive really showed some heart. Way to go girl! grass 52.31 (SCT 47). Olive looked better going into the ring but between the surface and yesterday's wheel we looked at this more as a warmup. Clean but over time. Windle Ewing 84.08 (SCT 75). Not a bad course layout for us, and entered the ring looking good, but it was clear that Olive was really fighting the heavy grass. NQ on time. Windle Ewing Even with making sure our pre-run rituals were in order, Olive couldn't get past the thick, wet, heavy grass. grass 54.10 (SCT 46). I didn't expect a Q after watching the course being wheeled, even if Olive had been quick. But Olive was still pretty slow, knocked the triple and missed the weave entrance. Windle Ewing NT (SCT 75). I was worried about handling some traps and discriminations, but Olive was so slow that I picked her up after the weaves (#12) and she was almost over time already. Windle Ewing The grass was thick and uneven, and it was muggy out (and sunny for Standard). Our first time back at Rohr Park was disappointing. grass 48.10 (SCT 46). Slow from the start on a course that had a lot of inside turns which seemed to slow her down more. NQ on time. Peter Liu 65.08 (SCT 73). A decent start but Olive almost ran out the dog walk and the slow down to mount sapped her momentum. A tough course, but not fast. Peter Liu Not clear whether the time off or the sun was the problem. Hopefully we can find the right combination next weekend. Laura English A good pair of runs under cloudy skies - humid but not hot. grass 48.66 (SCT 45). Olive never had much speed and looks like she tweaked her shoulder again in the weaves. NQ on time. David Nauer 60.45 (SCT 69). A little slow at the start of the course but looked good on the second half. Solid weaves, and a placement!. David Nauer Olive wasn't looking as good today. It appears that her right shoulder is still bothering her. grass 41.65 (SCT 46). Early tunnels and weaves got Olive fired up on the first run of the day. A little slow through a change of footing, but fast and clean. David Nauer 57.76 (SCT 72). Best standard run in several weeks, Olive drove hard the whole course even though the weaves were late. David Nauer A nice cool morning after a week off while I judged in San Diego. Olive seems a little sore on her right shoulder, but ran well. grass 51.75 (SCT 44). It was hot, and once again the dog in front of us took a long time being picked up. Olive never moved very fast. NQ on time. Beverly Morgan Lewis No time (SCT 76). Olive started sluggish through the first six jumps. When she avoided the teeter at 7, I picked her up. grass 48.69 (SCT 48). Wide after the starting tunnel, but mostly steady on a very twisty course. Knocked a bar, barely touching it. Not a bad run. Tom Slattery 63.34 (SCT 69). Not as fast as yesterday but still a decent standard run. The approach to the dog walk didn't allow much speed there. grass 50.63 (SCT 46). Sort of slow from the start, and I ended up cheerleading Olive, which never heps. Clean but over time. Beverly Morgan Lewis 60.98 (SCT 71). A slow start, but after the weaves at obstacle 7 Olive picked up speed and looked good. Nice fast dog walk. dirt under cover We figured there was no point in sticking around for this course, with another ugly start and the likely wheel. Besides, this way we could end the weekend on a good run. Jacqui O'Neill 59.32 (SCT 76). The surface was a lot smoother and tighter today, and Olive ran with a lot more confidence and attention. Unfortunately it was still sloppy on the left side where the double was, and Olive knocked it. dirt under cover 50.52 (SCT 47). The start of this course was a really demotivating figure eight, but Olive didn't do too badly. However she never picked up enough speed on the course and didn't make time. Jacqui O'Neill 72.53 (SCT 76). Not particularly fast, but a clean run. The surface today was even softer than yesterday, and Olive clearly didn't like jumping on it. dirt under cover 50.31 (SCT 51). Olive was a bit slow through the first few obstacles, including the weaves. It was like she didn't like the footing. But she ran fast the remaining 16 jumps, only to barely make time. grass 37.18 (SCT 46). Olive looked solid on the first course of the day, but took off late on the second to last jump and knocked a bar. Debby Wheeler 64.32 (SCT 74). The sun came out before the second run and it was getting hotter and muggy. Still a good run. grass 43.70 (SCT 48). Not quite as hot for the first run today, and really worked on focus before entering the ring. Olive looked good. Darryl Warren 66.34 (SCT 72). Close to 90 degrees at our run time, and I didn't do quite as good a job keeping her focus before the run. A short yelp coming out of the second tunnel, but she seemed ok.
grass 51.26 (SCT 45). We tried to keep Olive cool before the second run, not warming up too much. But she still seemed hot as soon as she got on the line, and didn't run with any energy at all until the last four obstacles. NQ on time. Ouch. Darryl Warren 59.02 (SCT 70). It was really muggy as we waited for our run, and Olive seemed hot. We'll work on keeping her cooler in jumpers. Nose down almost the entire run, but she was clean. Darryl Warren The first weekend of summer temperatures for us. Is Olive burning out? Are we pushing too hard? Or is it the heat? Dale Mahoney 56.55 (SCT 68). A pretty good run on yet another trappy course. Olive wasn't looking 100% but did manage a nice Q.
Dale Mahoney Olive's digestive tract wasn't feeling too hot, more than the usual stress of competition. Maybe something she had wasn't good (although Asti mostly ate the same items). grass 38.62 (SCT 43). Both of today's courses were really twisty, which could have been good. But there was a long delay before our run and I think Olive lost her focus a little. Clean, but not fast. Dale Mahoney 58.53 (SCT 73). Several traps in places that have bitten us reccently, such as the trap chute after the A-frame, but Olive was attentive and picked up a nice set of MACH points. Dale Mahoney We need to start working on start line drive, but otherwise a really nice performance. dirt under cover 41.48 (SCT 45). A fun tight course. The footing in the arena wasn't very nice, and Olive clearly wasn't comfortable on it. But she worked hard on both runs and didn't even click any bars. Mark Upshaw 58.72 (SCT 74). Several traps of the sort that have caused problems in our last two runs, but a combination of slower speed (due to the footing) and careful handling led to a Q.
dirt under cover 47.59 (SCT 51). A tricky course made harder by really wide obstacle spacing. Olive seemed to be put off by the long (25' plus) runs between jumps. Still, she was clean to finish up the weekend with a Q.
Linda Robertson 60.78 (SCT 73). Another fast run and again we were hit by Olive being faster than I expected. We picked up a runout when I turned my back on her at a front cross. Later we got a wrong course again when I turned my back on her. I need to keep my eye on her as she speeds up. dirt under cover 42.03 (SCT 46). Olive started fast but slowed down through a big pinwheel. I realized late that I was cheerleading her - which tends to slow her down. I'm not sure whether I was pushing after the NQ in standard, or just forgot to let her run. Missed the last weave pole (handler error - slo-mo video showed me taking a big step at pole 11). indoors on plastic covered carpet 40.42 (SCT 48). Third run of the day and Olive looked as good as on a day with two runs. Definitely more confident with the footing. We were running careful, with wide lines at points to get good jump approaches, and missed high in trial by just .31 seconds. Carla Boudrot 63.76 (SCT 73). Olive didn't like the feel of jumping on plastic covered carpet, and seemed very nervous on the teeter and dog walk (the reflections on the plastic may have looked like water). But she was brave and turned in a good performance. Carla Bourdrot Olive also earned her NF title between the standard and JWW runs. We were so proud of her performance today! indoors on dirt 42.19 (SCT 52). Second run of the day, but aside from a wide turn after the triple Olive was awesome. Once again, finished fifth out of about 25 EXB dogs. Victoria MacVicor 55.02 (SCT 73). Running tall to small we mis-timed the runs and missed our walk. Aside from a rough bit in the starting jump sequence, all was good. Peter Liu Bad time management on the human side, but a good performance by Olive. We managed her body temperature better than her handler's. indoors on dirt 32.11 (SCT 45). Another break in our schedule, and Olive was flying. Unfortunately she skipped pole 10 and blew the weaves. The amazing thing is that her time would have placed 5th out of the 33 EXB dogs! Peter Liu 54.86 (SCT 72). A wide flowing course, Olive felt a little warm going into the ring but ran well. Excellent contacts including a nice dog walk. Once again, Olive placed fifth out of 31 in EXB (and 16 qualifiers)! Larry Brockett A single day of agility after a long business trip, and Olive was still in good form. Excellent weaves and a ton of drive. Debby Wheeler We took Sunday off to work at home, and it was a hot day. Luckily Monday was nice and cool. Kera Holm We weren't in full "summer mode" for the first run, but brought out all the cooling tricks for the jumpers run. Janet Budzynski A really nice pair of runs, with two rally Q's in the same morning. dirt (outdoors) 41.75 (SCT 48). Olive looked great on the opening figure-eight, and continued on through the open running part of the course. A nice run. Larry Brockett 59.21 (SCT 70). I was working in the JWW ring and so we didn't get Olive up as early for the standard run, but even a little sleepy and warm she was solid. Larry Brockett A little cooler than Saturday, but the dirt had been turned and was quite a bit softer. Our first weekend with 4 Qs in 4 runs! dirt (outdoors) 46.57 (SCT 48). Olive looked a little cautious in her first run after being spayed. She didn't seem happy with the footing on all the parts of the ring, and had a small bobble at the weave entrance (nice save, Olive). Larry Brockett 58.62 (SCT 72). Olive looked really smooth on this flowing course. A little stumble in some heavier dirt, but a very nice run. Larry Brockett A nice cool day in the desert, although the sun was intense. Did our cooling routine like we would on a warm day. Dan Butcher Today's temperatures were a little cooler than Friday, and the ground dryer. A nice pair of runs. Tim Pinneri Olive got an 88 in Rally Excellent just before the standard run, and a 96 (and third place) in Rally Advanced before the jumpers run for her third RAE leg. David Hirsch A pair of really excellent runs. Olive is dealing with the distractions of a big show very well. Jacqui O'Neill In the last few weeks we've switched to giving her breakfast as her end of run party, and she seems more driven and really happy to celebrate. patchy grass 45.37 (SCT 45). Olive was a little slow on a course with a lot of pinwheels. I was on the inside of these turns, which meant I wasn't moving and that may have kept her from running fast. Did our first rear cross in competition (to the right). Susan McClair 52.48 (SCT 71). The standard course started on grass rather than in the dirt, and Olive ran a LOT faster. Unfortunately the take off for the triple was in a depression and she couldn't clear the extra height. Mark Upshaw Another decent pair of runs. As Olive starts running faster I should start paying more attention to the quality of the take-off zone on jumps, particularly the spreads. Mark Upshaw A really nice pair of runs to close out the year. Olive was so close to yet another double Q.
Lavonda Herring We practiced the weaves of death at home last night and Olive learned to take them seriously. Jack Cadalso Olive has pretty solid weaves now when the surface is good, but the uneven and loose dirt here at Industry is killing us. David Nauer The weaves on the second run were on-side... our problems have been with off-side on the second runs. So not sure yet if we've fixed the problem. David Nauer Really nice runs on a surface that Olive wasn't so great with the last time out. Both runs were before breakfast and she was DRIVEN. Beverly Morgan Lewis 51.67 (SCT 69). Olive was blazing fast throughout this course. Really awesome. Kylie Bourke It looks like I'm taking a big step at the end of the weaves when she isn't weaving at a steady pace. I need to work on that. Tami Domico When we first saw the courses we didn't expect to Q on either course. Olive did well. Her handler wasn't as sharp (a head cold). Dan Butcher A really nice pair of runs. Olive had been sluggish in class this week, but looked great. grass 50.65 (SCT 48). A little sniffy on a course that was loaded with gopher holes, stopped just before jump 6 to investigate one, earning an R and losing some time. Sharon Kihara 72.28 (SCT 76). A pretty nice run until a handling error caused us to miss the weave entrance. Lost almost 9 seconds in the weaves between restarting and something that smelled really good. Sharon Kihara Another layoff plus some less than ideal scent conditions. Actually close to a Q on both runs with just small errors. Lavonda Herring Despite another long business trip layoff and being 4 weeks pregnant, Olive looked strong. grass and dirt 46.80 (SCT 50). Not a bad run on a very twisty course, with a very uneven grass surface. Knocked a bar. Candy Geiser 66.66 (SCT 73). Still not enjoying the footing (a bit of bunny-hop at some points) but plenty of speed to qualify. Mark Upshaw A little rusty after two weeks of business travel, which may explain the knocked bar. Not our favorite site. dirt 52.97 (SCT 46). The footing was pretty loose on this course, but Olive also didn't seem as up as she was earlier in standard. Got a runout at a tunnel entrance when I ran past trying to help her drive in. Jacqui O'Neill 63.24 (SCT 70). Really nice warmups and ran well until the weaves. Slow to enter and then popped at pole 10. We need to work on weaves in loose dirt. Lavonda Herring A better day than Sunday. Lots of dogs had trouble making course time in jumpers. dirt 48.78 (SCT 52). Not a bad run but dropped a bar early on (late takeoff), and after that point she was very cautious at jumps. Lavonda Herring 75.42 (SCT 73). Rather slow anywhere the footing was loose, which was in many parts of this course that had been chopped up by the big dogs. NQ on time. Jacqui O'Neill Olive seemed a little out of sorts all day, but the bad footing in standard was a bigger issue. dirt 46.51 (SCT 48). Olive looked like she didn't like the footing on the loose dirt, and never had a fast pace. Still good enough line to qualify. Jacqui O'Neill 68.37 (SCT 71). Still not looking fast on the dirt, and almost stalled out at one point. Olive looked a bit hot going into the ring the second time. Lavonda Herring We were the first dog in 8" for the first time, and the delays of setting bars threw us a bit. HOT 47.10 (SCT 42). Skimped on the pre-run ritual and didn't have Olive's attention. Sluggish and blew the weaves. We don't think she really likes Brookside's Jumpers ring. Larry Brockett It was very hot (high over 100) but Olive showed she can run in the heat, run a second run, and still Q.
Kitty Bradley Olive seems worried about something at this park. She was looking over her shoulder a lot. Cris Baldwin It was sunny, hot, not much time between runs, and yet the warm-up routine worked great. Olive was amazing. Peter Liu The marine layer kept things cool for these early morning runs. A second day of good results from the new pre-run routine. grass 49.04 (SCT 50). Badly missed a straight-on weave entrance (in at pole 4). We need to review tape in slow-mo to see what went wrong. Otherwise a strong second run, under time! Robin Veenema 62.44 (SCT 76). As fast as we've seen Olive run in a long time. We worked on pre-run warmups a lot and she was utterly in the game. Robin Veenema We spent a lot of time working on pre-run warm-ups, and Olive seemed to be very well focused on both runs. grass 50.16 (SCT 46). Popped weaves at pole 10 and ran rather over time. The sun had come out and it was quite a bit warmer than the STD run, and Olive wasn't as "up" after warmups. Robin Veenema 66.89 (SCT 76). A nice solid run, not super fast but we didn't waste any time with wide turns or the like. Robin Veenema We tried several different warm-up techniques today. It's hard to know exactly what the problem with the second run was. grass 55.05 (SCT 50). Not fast, but OK speed for most of the course, but really slow at the weaves and missed two poles. This was the first run of the day, which is usually her faster run. But it was after noon and pretty hot out. Alan Arthur 76.06 (SCT 71). Wasn't running particularly fast, but actually gave up at pole six of the weaves. I thought about picking her up, but since we were close to the end of the course, we just finished out. Alan Arthur Olive was playful and upbeat at camp and away from the ring, but got sniffy and slow nearing the ring (and the practice jump). long grass 52.01 (SCT 43). Olive never looked very fast on this twisty course, but at least she "ran" the whole course. NQ time. Larry Brockett 71.17 (SCT 70). A few slow bits throughout the course cost us a Q. Olive was definitely worried about something outside the ring, probably barking dogs. NQ time. Scott Stock It's tough running clean but not fast enough. Is this the noise, the heat, or just where she is in her development? long grass 50.78 (SCT 41). Third run of the day and Olive looked sluggish for the first five obstacles. Stopped in a 180 mid-course, deciding whether to leave. Lost 7 seconds there. NQ time. Scott Stock 72.31 (SCT 74). A little sluggish (second run of the day) and stopped to look at the judge on the A-frame. Still, made time. Larry Brockett Olive picked up 8 points in Time to Beat to start the day. Grass was long but still she wasn't running fast. long grass 42.15 (SCT 48). Olive was blazing through the course. Wide out of a tunnel (I should have used a serp hand) and ended up with an runout, but by far her best JWW run in a long time. Laura English 63.56 (SCT 69). Course had some tough features for Olive (like dog walk to tunnel that we blew at DCA) but she handled well, not too much sniffing on the second run of the day. Laura English First day back after a break, and Olive had great drive, even around the ring entrances mid-course. dirt 50.10 (SCT 43). Ran (albeit not super fast) the entirity of a twisty jumpers course. I'm proud of the run even though she was well over time. Jacqui O'Neil 74.45 (SCT 76). Hard call-off from A-frame left me out of position for weave entrance and I pushed her to the second pole. Kera Holm Third day in a row and Olive was a little slower on both courses. Warm up and ring entry routines went well. dirt 45.97 (SCT 46). Olive stayed focused on the second run of the day (good warmup routine). Not so fast on turns when I'm static (on the inside). Kera Holm 69.22 (SCT 74). Several faults - crossed behind me to take wrong end of tunnel, early front cross off teeter caused flyoff, and stopped at bar when returning to start. But still fast, enthusiastic, and engaged. Jacqui O'Neil We were more careful to follow a fixed routine both warmup and in the ring, and it worked nicely. High value reward definitely keeping her attention. dirt NT (SCT 42). Olive was sniffy from the go and stopped in front of jump three to sniff more. I picked her up. I've got to remember that she's not Remy, and needs her steady routine in the ring. Kera Holm First day using high value treats (smoked liverwurst). She was very happy to work for them. In JWW I didn't follow our routine and lost her attention. mats 49.96 seconds (SCT 45). Third run of the day, Olive was sluggish and missed a weave pole. Both of us were tired. Tom Slattery 60.91 (SCT 67). Fast and confident start to the day but we had trouble with a dogwalk to tunnel turn and I didn't support the tire later on. I'll take an NQ like this. Good run. Tom Slattery Better earlier in the day and then more tired as the day went on (handler and dog). mats 42.85 seconds (SCT 44). A few hard call-offs (where expected) but a good run. Nose down on some carpet at one time. Tom Slattery 62.19 (SCT 74). A little slow at the start but then fast and confident for the rest of the course. Tom Slattery First time indoors on mats, and Jumpers showed a little adjustment. Great on the second run. loose dirt 56.07 seconds (SCT 46). Sort of slow throughout the course, but notably so in the weaves (very loose dirt) and after a pullback. Very twisty course. Dan Butcher 74.81 (SCT 73). A really nice looking run but Olive turned to something interesting in the dirt before the chute costing a refusal (and some time). Great running dog walk (ran at her side). loose dirt 47.95 seconds (SCT 47). Not bad time given poor footing (many dogs were slow). Olive ran well with JWW first in the day. Dan Butcher 69.71 (SCT 74). Still not fast in the poor footing, but drove well to obstacles. Slow dog walk, and a little wide as we passed near start. Dan Butcher Continued to work on attention and focus at start. Temperatures were really nice. wet grass 52.14 seconds (SCT 48). Olive acted like she was looking for Diane ringside, and got an R as a result. Slow. Asti ran the same course faster. Donna Gomer 67.34 (SCT 76). A lot better performance than yesterday, not fast but solid and never slowed down. grass 58.57 seconds (SCT 47). We worked on getting her focused on me at ringside before the run, and at least she stayed on the course. Knocked a bar. Rhonda Crane NT (SCT 76). Olive seemed slow from almost the start, popped out of the weaves and I picked her up. No sign of an injury after leaving the ring. Donna Gomer Olive was really inattentive. Not a very good feeling at the end of the day. thick grass 53.43 seconds (SCT 49). Still not fast but at least she ran the whole course. Could be the long grass, the heat, or extra weight that's slowing her down. Jan Skurzynski 73.87 (SCT 73). No major problems, but still wasn't running all that fast today. Could easily have been called for an R after the table. Lucky Q.
Peter Liu Olive's attention was better today but we still weren't very fast. A few degrees cooler than yesterday. thick grass No Time (SCT 50). Olive was looking good in warmups but blew off the weaves (no interest at all) and then left the course to Diane, ringside in the shade, at jump 7. Peter Liu 70.52 (SCT 72). Olive was acting distracted, actually stopping at the top of the A-frame (looking for Diane?). Not a great run, but still fast enough to Q.
Jan Skurzynski Back after a long break, it was hot and the grass was long. Not great conditions but not a good performance either. damp grass 47.39 seconds (SCT 50). I mis-handled a cross (too far ahead and started the turn to the next jump before she committed to the pervious) and pulled Olive off a jump, but otherwise she looked good. Maybe not as fast as the Standard run. Mark Upshaw 58.39 (SCT 75). A nice, fast run to get back into the game after a break. We could use some more speed on the dog walk if we want placements. Mark Upshaw Olive did great even though her handler was jet lagged. The NQ in Jumpers was definitely a handler error. Grass and gopher holes 57.40 seconds (SCT 47). Great through the first six obstacles and then hit a stretch of fresh gopher holes. I couldn't keep her attention, picking up Rs and a lot of time faults. Scott Stock 54.68 (SCT 69). A little sniffy from jump 1 to dog walk but otherwise smoking fast. Offside weaves. Scott Stock Jumpers was depressing, but we worked on attention around gopher holes between runs and it paid off. Grass (warm) 56.63 seconds (SCT 49). This run looked better than the earlier Standard run, but her tail was still down. Missed an offside weave entrance, otherwise sluggish but clean. Mary Mullen No time (SCT 76). Olive was nervous at the practice jump, jittery at the start line, and ran to Diane several times. Picked her up after she turned out of the weaves at pole 10. Laura English Olive didn't look like herself today, looking over her shoulder and not running fast. I wasn't sharp either (late hockey game the night before). Not our best day. Jacqui O'Neil Olive looked a little slow anywhere the surface was sloppy.